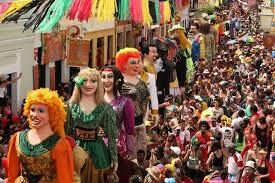 It’s Carnival in Brazil! According to Gabriel, our resident Brazilian cultural expert, “Carnival is the best!” Loosely tied to the religious tradition of Lent, Carnival is a party to beat all parties. It’s a chance for everyone in the community to come together, to dress in outrageous costumes, to dance, to sing, to drink. Gabriel showed us some videos of Carnival past with friends. He found Youtube videos of different cultural dances and music. With the help of Google translate we translated many of the lyrics of the songs, so we could enjoy the lyrics as well as the incredible beat of Samba and Frevo music. “I don’t think you have anything like Carnival”, Gabriel said. “I don’t think so either”, I admitted. Gabriel was identifying an cultural difference between Brazil and the U.S., but struggling for the words. He has lived with American culture now for six and a half months and the honeymoon is over. Sure we have some fun things of our own; baseball games, American football games, DisneyWorld. But we also stress out a LOT, work too hard, get angry easily. It is impossible to hide the ugliness of culture for too long from someone who is new and full of observation in the effort to learn. I nodded at Gabriel and said, “I know. I know what you mean”. I didn’t have the words either, but from the images I was watching of Carnival, of people of all ages dancing in the street, laughing at the cameras and simply enjoying life together, I knew I had never experienced that in my own culture; not regularly anyway. Americans don’t have week long parties with friends. Short of college-aged Spring Break trips (which I never had the luxury of attending) I can’t think of a time when friends, neighbors, and even people you’ve never met before gather together for a week-long party designed to celebrate all the goodness of life. It’s wild. It’s loud. It’s full of music, dancing, no sleep, and crazy behavior reserved only for Carnival. It must make incredible memories. It must bond together a culture in a way I have yet to experience. “You guys got to come sometime”, Gabriel said. That’s the only invitation I need. Thank you Gabriel for teaching us about Carnival- Recife style. Read more about Carnival on NPR.org There’s even a movie for your viewing pleasure.